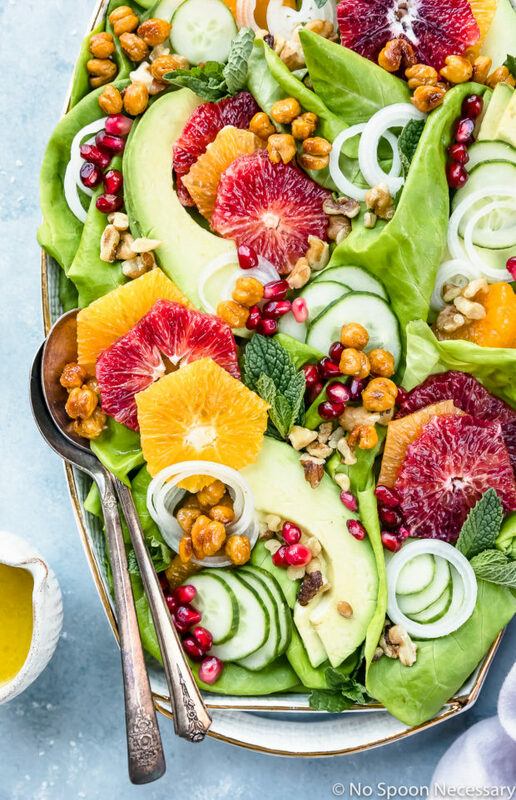 This stunning Winter Citrus Salad is quick, easy and comes together in 15 minutes or less! Finished with a Honey Citrus Vinaigrette, it’s the perfect refreshing side or light dinner! 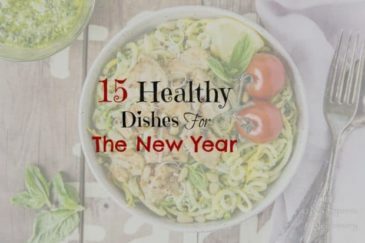 I hope you haven’t had your fill of winter salads yet, because I have one for the record books! If you are into citrus, this salad is seriously going to give you life! And, if you aren’t, well, this salad will definitely make you see citrus in a whole new, delicious light. Fresh, crisp little gem lettuce layered with juicy oranges, crisp cucumbers, creamy avocado, mild shallots and fresh herbs. 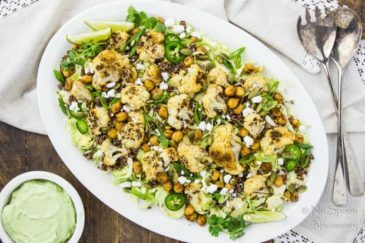 Scattered with jeweled pomegranate arils, nutty walnuts and crispy chickpeas; then finished with a silky, smooth Honey Citrus Vinaigrette, this salad is refreshing and packed with texture! 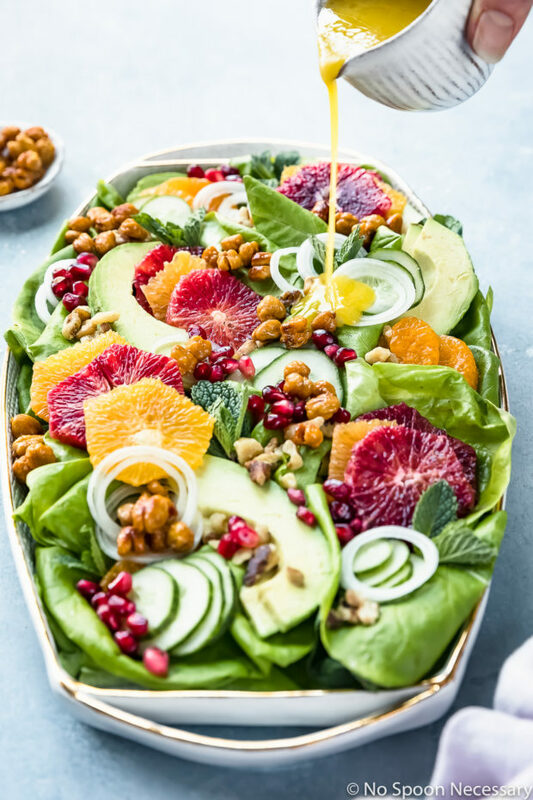 Ridiculously easy to make and bursting with flavors and colors, this citrus salad is an epic way to celebrate winter citrus! Perfect for lunch, served as an appetizer or enjoyed as a light dinner, this simple winter salad is elegant enough for entertaining and fast enough for a quick weeknight meal! 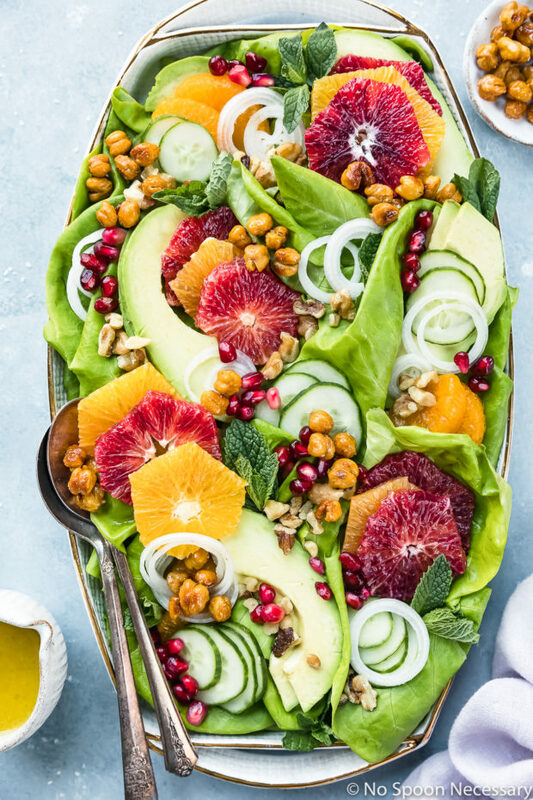 A citrus salad is jewel-like in color and the perfect way to celebrate fresh winter fruit! 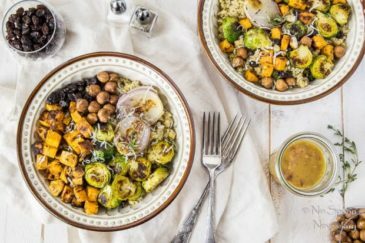 Made up of a variety of citrus, these salads can also incorporate other flavorful ingredients such as fresh greens, avocado and beets to name a few. Typically finished with a silky vinaigrette, citrus salads can be served chilled or at room temperature and are refreshing, light and extremely tasty! How do you make citrus honey dressing or vinaigrette? Citrus dressings, or vinaigrettes, are quite simple to make! 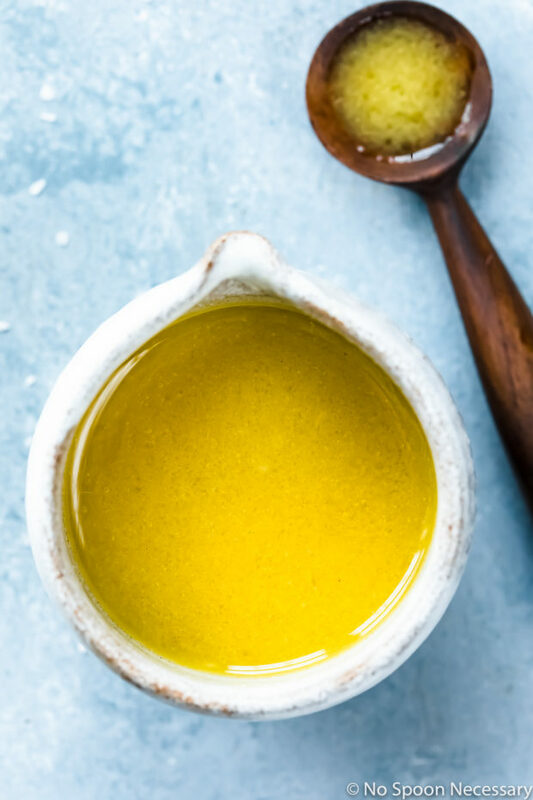 With citrus as the primary acidic ingredient, honey serving as a balancing sweetener and various add-ins, such as shallot, garlic or fresh herbs, whisked in for flavor, citrus honey dressings are a great way to take a boring salad to the next level! To make a citrus honey vinaigrette, or dressing, whisk citrus juice with vinegar, honey, Dijon mustard and minced garlic. Season to taste with salt and pepper. Slowly drizzle in extra virgin olive oil while whisking to emulsify. Types of citrus to use in salad? 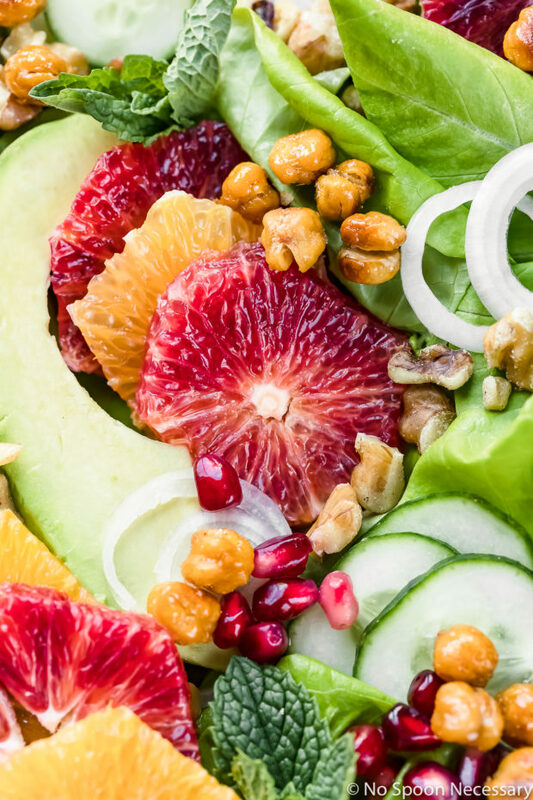 If you are looking to make a stunning citrus salad with plenty of flavor, try incorporating a few varieties of citrus in your salad for a rainbow of colors. Or, for a simpler look, use two types of citrus and alternate colors. Blood oranges – Crimson fleshed with a tart to semi-sweet flavor depending on type. Navel oranges – The most common variety of oranges. 1. If you want to save time and make this citrus salad quick and easy, you can use plain (un-crisped) chickpeas. Simply rinse and drain the chickpeas, then add them to the salad as is. 2. If you aren’t a fan of chickpeas, you can substitute rotisserie chicken or salmon for the chickpeas! Or, if you are looking for a boost of protein, feel free to use both chickpeas and chicken or salmon! 3. If you are looking to impress, try supreming your citrus! Just make sure you remove as much of the white pith around the oranges as possible to avoid any bitter taste. How to cut citrus for salad? To take your salad to the next level and elevate the presentation, alternate the types of cuts you use on your citrus. Peel and thinly slice some citrus and then supreme the rest. Supreming is a culinary technique that removes the rind from citrus so it can be served in pretty segmented slices. Trim ends. Set citrus on clean work surface and trim off the ends with a sharp knife. Remove peel. Following the shape of the citrus’s sphere, slice off the peel and pith in long sections. Slice into segments. Set the fruit on its side and use a sharp knife to cut towards the center, along the membrane. Next, slice along the adjacent membrane until the cuts meet to release the segment. 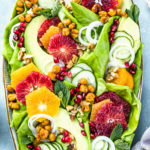 Healthy, colorful, and loaded with everything delicious, this winter citrus salad is perfect as lunch or a light meal, or it’s the perfect compliment to brunch and dinners! Until next week, friends, cheers – to citrus season! *The recipe below calls for these Honey Roasted Crispy Chickpeas. This stunning Winter Citrus Salad is quick, easy and comes together in less than 15 minutes! Finished with a Honey Citrus Vinaigrette, it’s the perfect refreshing side or light dinner! Assemble the salad: Layer lettuce with oranges, avocado, shallots, cucumber and fresh herbs. 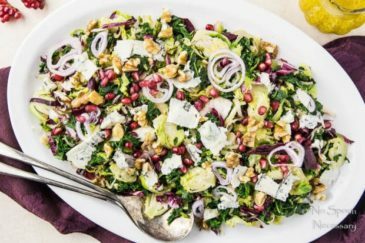 Sprinkle with pomegranate, walnuts and crispy chickpeas. To serve: Drizzle with dressing and serve immediately. Enjoy! If you want to save time and make this citrus salad quick and easy, you can use plain (un-crisped) chickpeas. Simply rinse and drain the chickpeas then add them to the salad as is. If you aren’t a fan of chickpeas, you can substitute rotisserie chicken or salmon for the chickpeas! Or, if you are looking for a protein boost, feel free to use both chickpeas and chicken or salmon! Make sure you remove as much of the white pith around the oranges as possible to avoid any bitter taste. · Trim ends. Set citrus on clean work surface and trim off the ends with a sharp knife. · Remove peel. Following the shape of the citrus’s sphere, slice off the peel and pith in long sections. · Slice into segments. Set the fruit on its side and use a sharp knife to cut towards the center, along the membrane. Next, slice along the adjacent membrane until the cuts meet to release the segment. *Nutritional information includes dressing, but does not include crispy chickpeas. I love citrus season, Cheyanne – and I am so making this salad! Love all the taste, texture and flavor you’ve got going on in this salad. We’ve had cold, rainy days here – this would be a perfect little bit of sunshine in a salad! I could eat that whole platter myself!! What a spectacular salad, Cheyanne! Love the creamy avo paired with zingy citrus and crunchy cucumber – so much YUM! WOW! Such a beautiful presentation of this salad. Your combination of citrus fruits is perfection. Agree that it is bursting with color and flavors! This salad is giving me life just by looking at it on my screen Chey. The colors, the flavors, all the yummy ingredients. Yes, yes and yes to it all! Can’t wait to make one for myself! Happy weekend! This salad is too pretty for words! Even though it uses winter produce it screams SUMMER to me because of all those colors. I just want to do a faceplant into your pics! Have a great weekend, Chey! You might remember my love for a good salad, and I’d happily confirm you’ve created a perfect winter salad which is bright (winter days are dark and miserable enough), refreshing, light, yet satisfying. Yay to the season of citrus fruit. Also, thanks for this quick citrus fruit guide. I was thinking another day what was the difference between “mandarin oranges” and mandarins. I guess I’ve just found the answer:) Beautiful work, Chey!